Designed to cope with narrow, short blade or Japanese chisels capacity 0 to 1 inch. Unlike a lot of other guides the relevant working underside of the chisel is used as the correct datum, making contact with the guides two stainless steel location rods. The rollers are expensive Ertalyte TX low friction material, self lubricating. Full instructions included. My no.1 guide copes very well with wood engraver's burins or gravers. Produces a very flat crisp rake face. 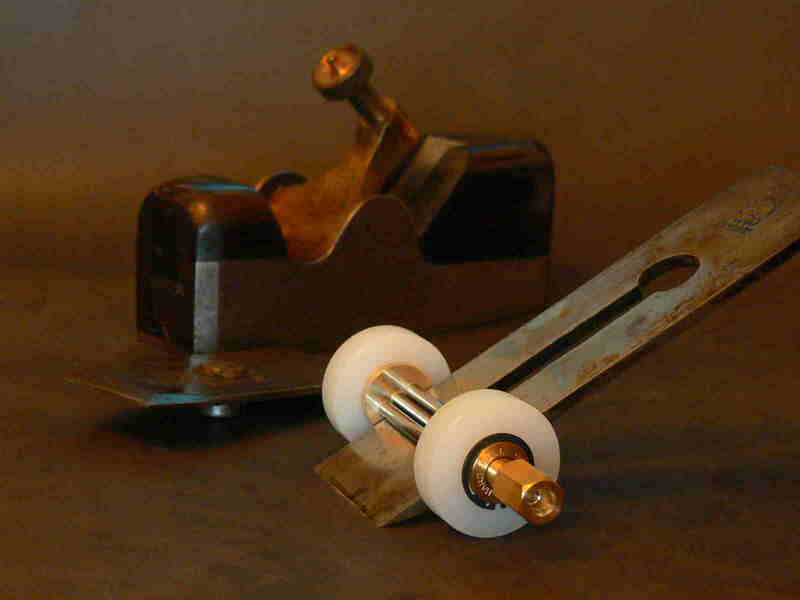 These guides are highly prized by woodwind players for sharpening reed-making equipment. 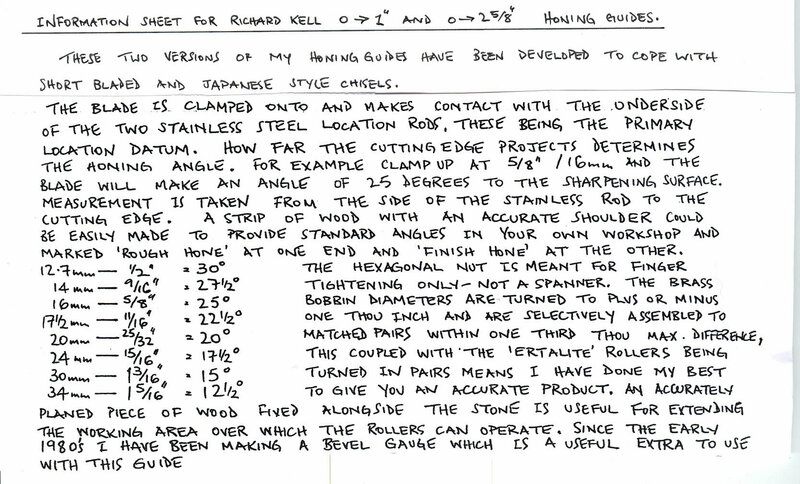 Here is an extract from Keith Smiths very informative multi-part Woodsmith Special Investigation into Sharpening ; starting September 2005. Reproduced courtesy of The Woodworker Magazine Highbury Leisure Publishing Ltd ©2005. Here is illustrated my MkI version. From autumn 2005 I've available a MkII version which is without the sprung pin and associated housing. Note that the two hardened and ground steel pins which are press fitted into the datum plate will still enable you to 'space off' any skew desired. 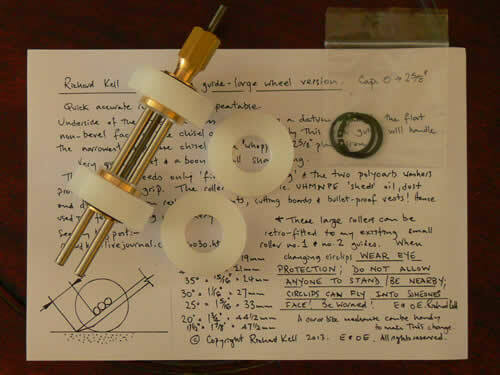 Richard Kell conventional and skew honing guide. As with all my guides,uniquely the correct working face is used as the datum. Two very accurate hardened steel dowels provide the 90Â° datum for plane irons and chisels. 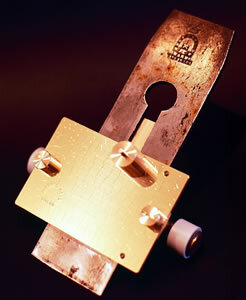 The spring loaded pin (visible as the machined spring housing at upper surface of datum plate) provides location for Lie Nielsen skew blades, otherwise any skew R.H. or L.H. can be held by using a slip of hardwood against the appropriate steel dowel. 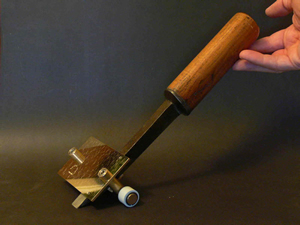 The clamping is by a wooden wedge, pattern provided, and is the fastest way to clamp - just as in an old-time wooden plane. Full and comprehensive leaflet included. Exceptional quality in solid brass and stainless steel. For example, the large datum plate is made from engravers 'compo' sheet which is guaranteed much flatter than any usual brass sheet. Costs more but it's worth it. 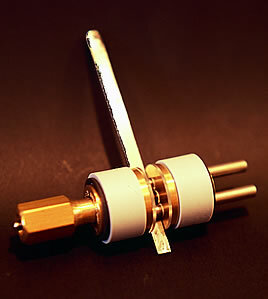 Capacity 0 to 2-5/8 inch width. 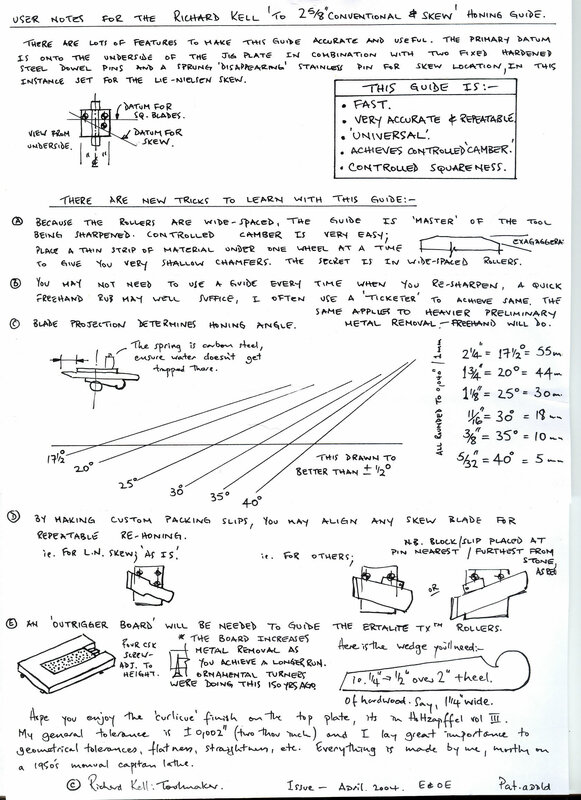 User Guide 566k (This is a scan of my hand written user guide in .jpg format. For the best result download and save the file on your computer [right click the link and select "save target as"]). Mk II: Price £45.45 ex vat. Mk I available at £58.94 please see my honing guide page.